How To Maintain The Handpieces You Want To Keep Using Industry Best Practices To Save You Hours Per Handpiece In Maintenance Time and $1000’s of Dollars. I’m sure you’ve said a similar phrase to your patients “floss the teeth you want to keep”. I know my dentist has said that to me. The same philosophy and approach applies to maintaining your handpieces. If you want your handpieces to last longer, then the better maintained they are, the longer they will last and cost you less to service and repair. Strict surgery handpiece maintenance procedures are crucial in ensuring longevity of your handpieces. From our years of service to dental surgeries we’ve found that many practices do not follow handpiece maintenance policies and procedures for cleaning, autoclaving and lubricating handpieces. Some surgeries rely to heavily on automated cleaning and lubricating machines and fail to get them serviced thus causing failure with their handpieces. If your surgery has an automated cleaning and lubricating machine please make sure it is serviced and maintained as per the manufacturers specification otherwise your handpieces will begin to fail. Developing and adhering to handpiece maintenance policies and procedures will help you and your staff keep to run a smooth, effecient and effective surgery and most importantly keep your costs down. Holding the can upright, insert the specified nozzle into the base of the handpiece. Complete the Handpiece Repair maintenance check-list here and receive a free 1-on-1 consultation with one of technicians. Some surgeries soak their handpiece in sterilising fluids, which are supposed to sterilise handpieces but they have chemicals that can cause some of the severest damage to handpieces. The liquids create a building up of gunk and can cause an awful odour to eventuate, blockage of air and waterlines and they also deteriorate o-rings, washers and seals. Other surgeries will just soak handpieces in water which is also very bad for handpieces. Soaking handpieces in water will cause them to rust internally. Make sure the lubricant you use on your handpiece is suitable for your surgery’s handpieces. From time to time again surgeries can experience air and water line blockages in their handpieces. Blockages can occur due to unnecessary chemical soaking procedures or because the delivery unit has not been serviced for some time and it is passing unfiltered water with dust and dirt particles through the lines. Make sure you get your unit service if the air or water lines are getting blocked. Light globes in handpiece wear out from general use. We are able to supply and fit new xenon or LED globes for all brands, makes and models of handpieces. In some cases the light globes are fine but the fibre optic bundle inside the handpiece has been damaged. We can in most instance replace or mend the fibre optics. These occurrence do happen form time to time. A small screw can seem like a very small and insignificant part on a handpiece but without it the handpiece may become liability to your surgery. Yes we repair coupling of all makes and models. Yes we repair micro motors of all makes and models. Some handpiece are glued together at the head. The heads of some handpiece will eventual come off. We carefully re-attach the head to the shank and locktight the head with super bonding glue. If your handpiece has been dropped it is not the end of the road or your job. In most cases we can restore handpieces back to working condition. 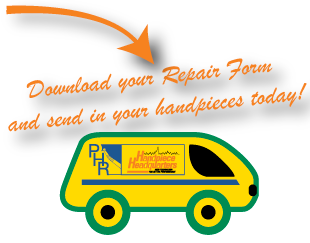 We gently reform the original shape and smooth out any dents on the handpiece. We can provide an anonymous service if you require discretion. If a bur is jammed do not pull the bur excessively or you may cause more damage to the handpiece. Give us a call to send in your handpiece and we will be able to remove the bur for you without creating more damage to your handpiece. Please note: if your water lines are still blocked after cleaning them please send in your handpiece to have the water and air lines unblocked.